The ‘pedal to peak’ programme lets the students ride to the Ponmudi peak. For moving around in the campus and recreational purposes, a major chunk of the engineering students now relies on cycling. THIRUVANANTHAPURAM: A cycling revolution has begun. In the sprawling campus of College of Engineering, Thiruvananthapuram, tucked in front of the five major departments are the newly set up cycling bays. Cycles are given for rent here. Special rides in the cycle are organised for social causes. The ‘pedal to peak’ programme lets the students ride to the Ponmudi peak. For moving around in the campus and recreational purposes, a major chunk of the engineering students now relies on cycling. 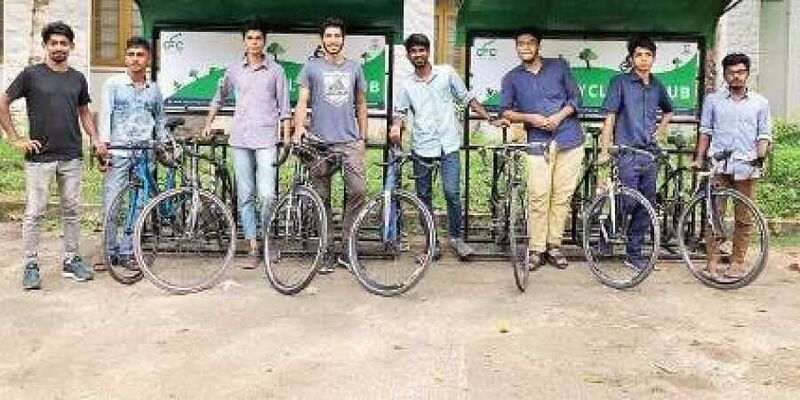 The zero-carbon mode of transportation is being embraced by the students, all thanks to the efforts of the students of the CET Cycling Club, arguably the first cycling club to be set up in a college in the state. “The dream is to spread cycling as a major mode of transportation among the youth,” says S Gopikrishnan, a final year civil engineering student at the college. In late 2015, the students pioneered a move to establish a cycling club in their college. “Apart from protecting the greenery in the college, the idea was to encourage the students to use cycle for their recreational purposes and outside the college. Other than helping reduce the carbon footprint, one also gets to enjoy the nature the best way while using a cycle,” he adds. The renting of the bicycles was started as a programme with the aim of introducing cycles among the students. “Only when they get introduced to cycling will they feel like buying one and shifting to it as a mode of transportation,” says Gopikrishnan. The students are all set to launch ‘Healing Wheels’, a programme wherein the proceeds generated from the renting of the cycle is donated to Pallium India for palliative care. For the past few months, the programme has been implemented unofficially. On Sunday, the programme will be launched officially. On an hourly basis, Rs 15 is charged for a cycle and for a whole day, the rent is pegged at Rs 60. At present, the cycles owned by the students are kept for rent. The college union had donated three cycles towards this initiative. “If we were to get a set number of cycles just for this purpose, then we can implement this cycling programme smoothly,” says Gopikrishnan. As part of promoting cycling, the club in association with the Indus Cycling Embassy and Goethe Zentrum Trivandrum organised a grand cycling treat for the students with the performance of 8th-time world trick cycling champion David Schnabel from Germany. Establishing a cycling network is their dream. The students are trying to reach out to the various colleges and promote cycling among the students. They have been successful in spreading the spark to the Government Medical College and the SCT College of Engineering. They are currently in talks with the management of the Mar Baselios College.